Of Tov has come out with a new product- schnitzel that is egged, breaded, and ready to cook/fry. It has all natural ingredients and 1.8% fat before frying. Now you can have freshly cooked schnitzel without all the mess! To print a 5 shekel coupon, click here or go to Of Tov’s Facebook page to have it sent to you by email. According to My Supermarket, it is selling for 27.90 shekels at Rami Levy and Shufersal. That is 5.58 per 100 grams,which is a shekel or so more expensive than the precooked schnitzels. Today is Friday. Rosh Hashana is Wednesday night. Are you ready? If not, use this list to help you get organized for the new year. If you have school-aged children, know that there are only three days of school next week- Sunday, Monday and Tuesday. Right now- make sure you have three sets of school outfits washed and ready, three sets of meals for school, and three water bottles if you can. (We fill the bottle about 1/4 – 1/3 full with water and put it in the freezer. In the morning we add cold water and the water stays cold all day.) Make sure they don’t need to bring anything special to school for the holiday- if so, put it on the calendar and get it now. Now hopefully you can “forget” about school for now. Do you have any last-minute haircut appointments, doctor appointments etc. to schedule? Be efficient- call at night and leave a message or book on the internet. I was surprised to call a hair salon and discover that they have a full messaging service at 11:00 at night! Get your last minute gardening/pruning/fertilizing done this week. 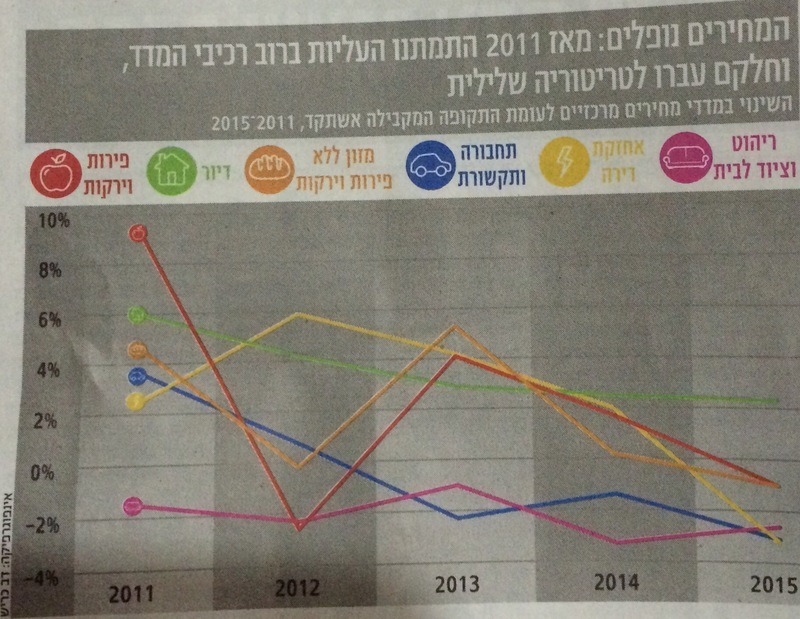 If you signed up for Otzar HaAretz, you should get your card by Sunday. If not, call them at 073-2206323. For more information, read my previous post. Try and get as much produce as you can now before the prices go up after the first of Tishrei. Going away?– if you are, make sure your neighbor has your key in case of emergency, timers are set, pet/plant sitters arranged. Laundry– make sure your tablecloths, towels, linens and holiday clothes are washed. If you have a European machine, you know how how long it takes so plan your time accordingly. Table– do you have enough tables and chairs? if not, arrange to borrow from a gamach or a friend now. Do you have enough tablecloths, silverware, plates, serving dishes, napkins, bowls and cups? If not, figure out how many disposable items you will need to purchase and get it soon. We found very nice biodegradable plasticware that looks just like the Solo brand and wasn’t too expensive. Don’t forget candles, matches and long-lasting candles. Food– Make an inventory of your freezer and start planning meals if you haven’t already. We all need to purchase fruits and vegetables this week- don’t forget apples, rimon, dates and a new fruit. Most stores are open Saturday night and have extended hours this week to get your last minute shopping done. If you use fresh chicken, don’t forget that because the Muslim and Jewish holidays collide this year, there won’t be fresh chicken being produced from Sunday-Monday until after the holidays. Pack your freezer now! You might be tempted to shop for groceries online, but just remember that you are one of thousands so expect many items to be out of stock. You don’t want your order to come Tuesday night missing half the items and you have to run out Wednesday morning for them. Clothing– do you have enough for a three day holiday? I know my son already outgrew the last set of clothing we bought him and we have so far been unsuccessful in dragging him in to purchase another -gasp- three outfits. Kids– make a list of everything they can do and have them do it. If it makes your life easier, bribe them. We have offered 10 agorot- 1 shekel per chore (depending on their ages; can be done multiple times) or three levels of rewards- ice cream, pizza, movie depending on how many they do and whether they work together or not. I will post some recipes/activities to keep them busy Wednesday while you finish your last minute chores. Beit knesset– if you go, do you have your seat/membership paid for? If you can, find out where your seat is beforehand so it will be easier to find it during services. Do you have enough machzorim? Do you know where they are? If you are not going, do you know who can blow the shofar for you? If your beit knesset has a tzedaka campaign during the holidays (selling honors or having someone come in from another agency), budget now what you are willing/able to spend. Discuss it with your husband/wife so there are no surprises. That’s it for now-don’t forget to take breaks and eat healthy! We are down to the home stretch before school starts- for the great majority of us, the children fly the coop on September 1. Here are some activities to do if you have run out of ideas how to keep everyone happy. (1) If you haven’t done so, now is the time to get school books and supplies. Today is the first totally quiet Friday in a while and the multitudes are definitely taking advantage. The school supplies sales this week are not heavily advertised- no Kravitz coupon this week, no ad for Idan 2000 or HaPirat HaAdom for example. Bank HaPoalim customers get cash back at Kfar Shaashuim- check out the deals on their web site. The Haredi yeshivas are all on vacation so the stores in those neighborhoods should be quieter during the day. Home Center is having a sale on school supplies as well as student desks and chairs- you can see the ad here. For tips on what and where to get school supplies, check out my post from last year. (2) The תשע”ה – 5765 – school vacation schedule is online. Go to your local crafts or office supply store to get a pad of big block paper and make a master family calendar. Along with the school schedule, mark who is in charge of dinner each night, have them fill in their meal choice and start doing the shopping now. I am a big believer of assigning children responsibility for dinner- it reduces the amount of “Icksa” complaints and encourages responsibility. Let each child prepare according to their age level- from cutting up vegetables to grilling burgers- make it fun and simple with some basic rules (marshmallows cannot be a main course, each meal must have a vegetable) and you are on your way. Cookies- you can freeze dough or baked cookies. Make a batch of sugar cookies and let the kids “paint” them with a mixture of powdered sugar, food coloring, water, and vanilla extract. Cakes- there are lots of simple cake recipes- buy smaller “English cake” trays and have each kids make their own. Don’t forget trifles for those not-so-perfect cakes! Challah- kids love rolling and shaping challah- why not have rolls instead of large challahs? I know we always end up with lots of challah slices and nothing to do with them them. Having lots of smaller challahs gives you enough for each bracha without a lot of waste. Chicken- you know the prices go up before the holidays, so get what you can now and freeze it. Put the raw chicken in a marinade and then freeze it- it will make the chicken softer and more flavorful. Or you can purchase Of Oz chicken which comes in thick vacuum packages which are great for freezing. Meatballs- spice them up and freeze them as individuals on a tray, then package them in bags, or cook them before freezing them. This is not a job for the kids, though. Potato kugel- if you don’t have a “freezerable” recipe, there is one on my blog. Soup- it is never a bad time to make chicken soup. Meat boreka- brown ground beef, add spices/sauce, put it on a sheet of puff pastry dough and roll it up. I cook this before I freeze it. It is best sliced cold, before it goes on the plata. You can search the blog for TNT recipes for the freezer. (4) Clear out that smartphone and make a digital album at Albombom. Right now they are offering 45% off each album until 31 Aug 2014. They also have great deals on personalized calendars. Lupa is also having a sale on photo calendars- buy one, get two free. (5) If you are a former New Yorker, you remember Shakespeare in the Park. In Jerusalem you can have the same experience without waiting for tickets. 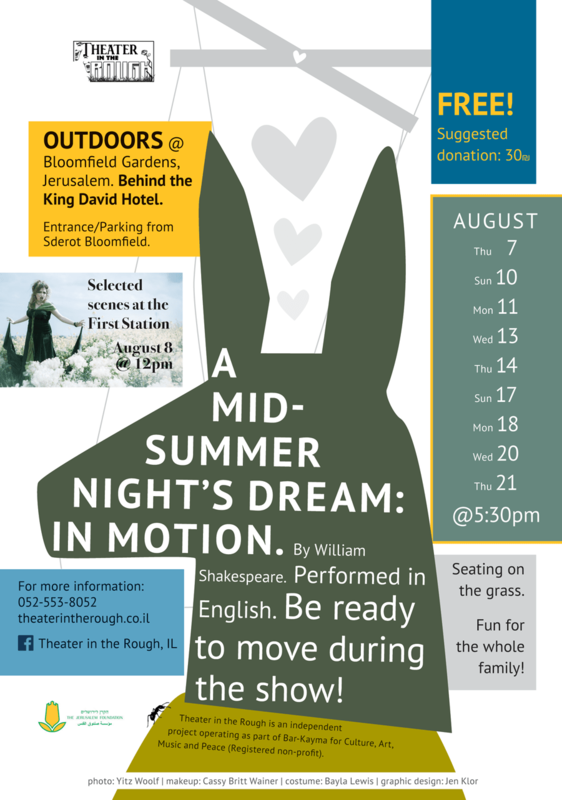 Theater in the Rough is performing A Midsummer Night’s Dream next week for free and in English. For more information, click here. (6) Once school starts, the parade of birthday parties will start as well. Stock up with presents at Toys ‘R Us. Use your Leumi card to purchase 300 shekels worth of merchandise and pay only 200 shekels! You must pay with your Leumi card and there are no double sales. For more details click here. Expires 31 Aug 2014. (7) The Chutzot HaYotzer festival started this week and ends the 23rd of August. Discount tickets can be found at the Leumi card web site for 61 shekels each instead of 65 shekels. Other discounts are available for Jerusalem residents, students, Bank Yahav customers and more- go to the festival’s web site for more information (Hebrew) (English). (8) The holidays will be upon us before you know it and chances are you will be invited out for a meal or two. Instead of the standard bottle of wine or flowers, go to a paint-it-yourself ceramic studio such as Kad V’Chomer in Jerusalem, Keyad HaDimyon in Modiin, Rebecca in Moshav Yitzron or Studio Nomi in Herzliya and create a unique gift for your hosts. Post your ideas and suggestions as well! Aliyah tip #6- Eat more meat- it’s cheaper! I have always suspected this while shopping here, which goes against everything I am accustomed to believe. Rule 1: Meat, especially kosher meat, is very expensive. Rule 2: Cheese and candy are cheap. Israel, however, breaks all the rules. 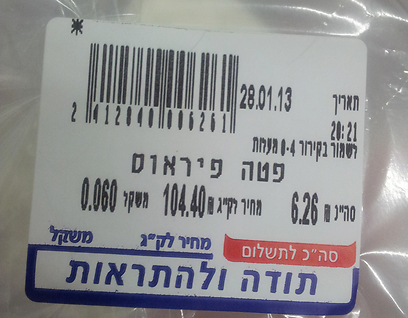 For example, A package of Tnuva Emek light costs 100 shekel/kg, while Tnuva fresh chicken breast costs 29.99 shekels/kg. Tnuva feta cheese: 106 shekels/kg versus TevaOf premium chicken breast- 54.90 shekels/kg. The scariest comparison- Bamba costs 119.60 shekels/kg compared to Shufersal fresh boneless beef ribs at 79.99 shekels/kg. The moral of this story? When shopping, throw away your chutz l’aretz rules. fleece sheet sets for 49 shekels (twin) and 69 shekels (double) (limit 3). Sales valid at Mega B’Ir and Mega Bul. It must be Chanukah- the sales are back! I haven’t posted for a while, mainly because there really wasn’t anything exciting to write about. Maybe the stores felt we are too busy paying off our credit cards from the previous holidays?! Bar Kol doesn’t have a web site to check out their sales- they have a phone number: 1-800-623-755. Some of their sales include: Angel cake for 8.99 shekels and Efrat Masoret wine for 10.99 shekels. The natural supermarket has joined the advertising craze this season as well. Some of their sales include: 12 medium organic eggs for 14.99, 3 cans of Yonah brand tuna in oil for 12.99 (for those of you who don’t know, Yonah is Starkist’s lower quality brand- made in Israel), Telma Branflakes for 16.99, and Shukha brand Persian rice for 5.99. Their web site is new and doesn’t have the sales yet, but you can check it out anyway. There are some very good sales here- citrus and some other fruits for 1.89/kg, fresh salmon for 49.99/kg, Special K for 14.99 (club members only), 2 750ml bottles of Smirnoff vodka for 89.99 (club members only), and Jacobs coffee for 24.99 (club members only). Check it out here. Mega’s shtick for the holidays is 8 sale items per week. 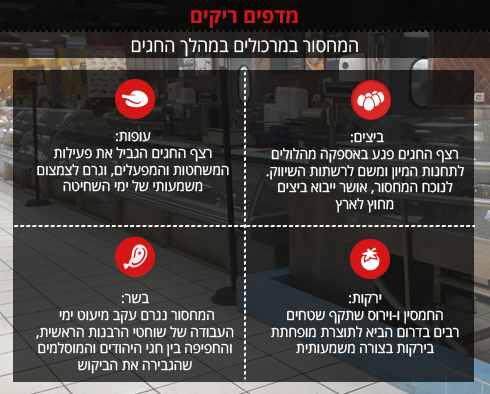 This week sale items include 2 1-liter bottles of canola oil for 8 shekels, 3 kilograms of fresh shnitzel or chicken breast for 50 shekels, citrus fruits for 1.99/kg, bakery goods for 1.99/100 grams, and Palmolive liquid soap for 7.90. There are limits and fine print- check it out here. MegaBul is also having an 8 shekel sale for YOU members, but I didn’t see any great bargains. You can check it out here. Shufersal Deal’s sale includes 25% off many brands of deli meat, 5kg of chicken thighs or quarters for 70 shekels (expires Dec 8), 2 boxes of Special K cereal for 29.99, 3 packages of Colgate 75ml toothpaste for 19.99 (note the regular size in the stores is 100ml), 4 bottles of Spring Tea for 19.99, and 25% off Sano Sushi products. Check it out here. Their sales are almost identical to Shufersal’s- 25% off many brands of deli meat, 5kg of chicken thighs or quarters for 70 shekels (expires Dec 8), and more. Their sales are only for credit card holders (except the chicken) and they also end the 8th. If you have their credit card, you can purchase Titulim Premium at 50% off and Pampers Mega Pack for 89.99. Check it out here.